I love fall! I love wandering the city aimlessly over crisp leaves with coffee in hand. The cool air touched with the smell of wood burning somewhere off in the distance. One of my favorite movies is You've Got Mail. In it, Tom Hanks comments on how amazing the city is in the fall. "It makes me wanna buy school supplies. I would send you a bouquet of newly sharpened pencils if I knew your name and address." I'd gladly accept that bouquet. For me, fall marks the transition from clean and crisp spirits to robust darker spirits. In a nutshell, it's whiskey weather. I set out recently to create a whiskey cocktail that encapsulated everything I love about this time of year. The UP & AT 'EM is a twist on the classic old fashioned. It combines the vanilla and oak of bourbon with the complimentary flavors of orange, chocolate, and coffee. The highlight of this cocktail has to be the cold brew ice ball. In lieu of traditional ice, I decided to create an ice ball using cold brew coffee. Simply pour your favorite cold brew into an ice mold and allow to freeze overnight. You can use your cold brew ice to flavor and chill your favorite cocktails or to simply make iced coffee. What I love about this cocktail, aside from how well all the flavors come together, is how the taste is constantly evolving. The UP & AT 'EM starts out as a bourbon forward cocktail then slowly mellows into an amazing coffee drink. It's a cocktail to relax with and enjoyed slowly over time. It's also my new favorite brunch drink. The coffee wakes you up and energizes you while the bourbon provides the kick in the pants needed to tackle whatever the day may bring. In a shaker combine bourbon, Grand Marnier, syrup, and bitters. Pour over cold brew ice in an old fashioned glass. This post is sponsored by Martell VSOP, however the thoughts and recipe are my own. It seems as we get older the summers get shorter and shorter. Wasn't I just making Old Fashioneds for Father’s Day? Pretty soon I'll be mixing up fall cocktails and pumpkin will become the top keyword searched on this site. But before we trade in our swimsuits for sweaters, I say we throw one last soirée. We relish in the long days and warm nights while they're still ours. For my end of summer celebration I’m mixing up some VSOP Mules. I was recently given the opportunity to sample Martell VSOP’s Blue Swift. Matured in French Oak casks, Blue Swift is a VSOP finished in Kentucky Bourbon casks. It's full-bodied with notes of vanilla and candied fruit. It’s smooth flavor and sweet finish played perfectly with ginger beer and lime. And the addition of muddled fresh blueberries made for a truly delightful cocktail. In a copper mug (or glass) muddle Blueberries with the VSOP. Ah, rum! That captivating spirit that launched a thousand ships throughout history in pursuit of its glory. A by-product of sugar cane, there are few rules when it comes to rum. While most would associate rum with the Caribbean, the production of rum is actually a world wide phenomenon. There was even a time that rum reigned in the United States. During the 17th and 18th-century sugar cane was imported from the Caribbeans for the purpose of rum production in Northern America. New England became the rum capital of America. LIGHT RUM - also referred to as "silver" or "white", light rum is clear in color and tends to have a milder, sweeter flavor. DARK RUM - dark in color, dark rums are generally aged in charred barrels and tend to have a spicier flavor. However, some dark rums are made with the addition of caramel to achieve color. OVERPROOF RUM - the standard rum has an ABV of 40% or 80 proof. Overproof rums have a much higher alcohol content, such as Bacardi 151 that has a proof of (you guessed it) 151 or 75.5% ABV. Dating back to the 1930s, this cocktail follows the "old fashioned" formula of spirit, sugar, and bitters. If you know any "tiki" drink, you must know the Mai Tai. Jamaican rum shines in this (surprisingly) refreshing but boozy cocktail. 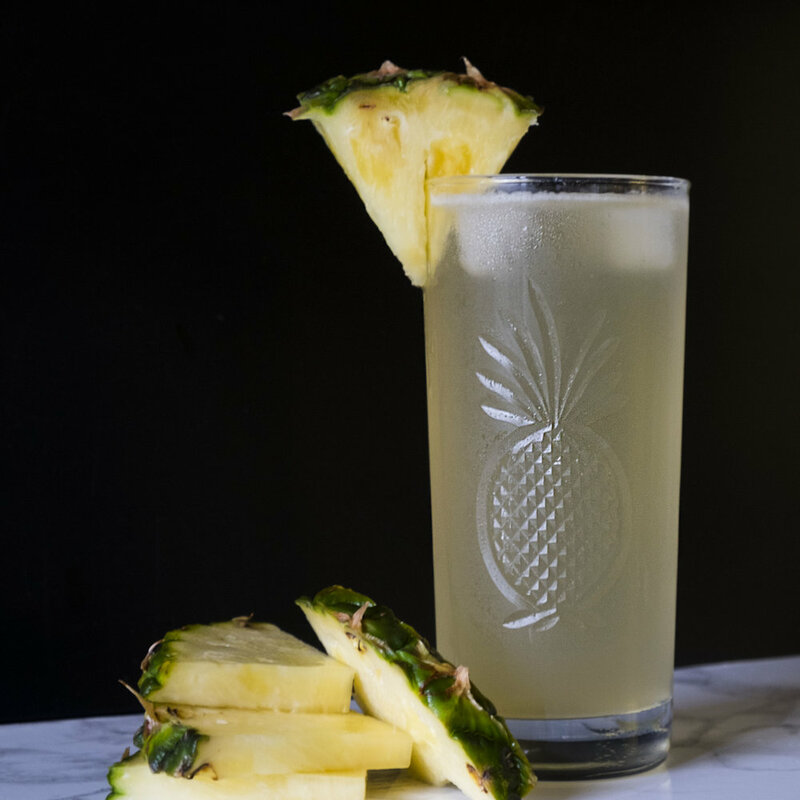 A healthy dose of Aged Rum cooled down with pineapple juiced and topped with club soda. An old fashioned style cocktail that features aged rum and substitutes traditional sugar with Velvet Falernum. A refreshing mix of rum, lemon, and mint. I don't think anyone can fully prepare you for the first few months of parenthood. The sleep deprivation, the diapers, the late night feedings, the sleep deprivation; it's all really overwhelming. So when I was offered the opportunity to attend a wine tour with Vino301 my response was an ecstatic "Yes!" I couldn't wait. A day away from the kid to relax with hubby. Sorry kid, momma needs a break. Our journey began when we met our driver Terry and our guide Larry (Or was that our driver Larry and our guide Terry) at one of two pickup locations. The two were extremely helpful and more than happy to guide us on our journey into Maryland wine country. We were provided with complimentary Vino301 stemless wine glasses, a wine tote bag, water, and snacks. When booking your Maryland regional wine tour, you have the option of four different regions: Chesapeake, Westminster, Patapsco Valley, or Heritage. Each tour features two vineyards with the option of adding a third vineyard at an additional charge. As the date of your tour approaches, you receive a notification as to which vineyards you will be touring that day. (The company also offers Chocolate and Wine tours, Bachelorette/Girls Night Out, and Custom Tasting Tours). My husband and I chose the Patapsco tour. The wineries we visited were Basignani, Boordy, and (added later) Dejon. At each stop, we were able to taste a select number of wines with the option to purchase. Needless to say by the time we reached our final vineyard we were feeling pretty good. Basignani is a quaint vineyard with a family atmosphere. Here we tasted our choice of 6 different wines. Including the local favorite Monkton Moon Delight, a "sweet blush wine made from mostly Seyval grapes with some of our Charmbourcin added for color." Basignani also features an outdoor seating area where brick oven pizza is available for purchase. The bigger and more well known Boordy Vineyards is always a crowd-pleaser. At Boordy we tasted a number of wines and received complimentary wine glasses. We were also taken on a tour of the vineyard and given a step-by-step guide of their harvesting, crushing, and aging processes. Boordy frequently hosts live music and community events. Last but certainly not least was Dejon Vineyards. Our tasting took place in a large barn on the vineyard's property. Of the wines we tasted our favorite was a sweet Vidal Blanc called Sweet Denise, named after one of the owners. A slightly sweet white wine with delightful citrus notes. At Dejon we decided to sit and enjoy the wine we purchased there in complimentary glasses, along with the meats and cheeses we brought with us. It was the perfect ending to a great afternoon. All-in-all Jay and I had an amazing day out tasting great wines while supporting local vineyards. If you live in the Baltimore area, or in town visiting, check out Vino301 for an afternoon with the best wines Maryland has to offer. Though a complimentary tour was provided for this review, the thoughts here are purely my own.. I'll be honest I'm not a fan of summer. It's hot, sticky, and I hate to sweat. But the great thing about summer is all the wonderful produce available. Amazing fruits and vegetables to brighten up your cocktails and inspire creativity. A summer cocktail should be light, refreshing, and easy to drink. When I set out to make my summer cocktail I knew I wanted to make a shrub, a vinegar based syrup. I love shrubs because they can deliver a punch of flavor in a small dose. I decided to make my shrub using some colorful heirloom cherry tomatoes and fresh mint. The combination has a pleasant taste that keeps you coming back for more. Combine in air tight jar. Refrigerate for at least 24 hours before use. The Tomojito Sour was inspired by the Mojito but takes things a step further with the addition of heirloom tomatoes and yellow chartreuse. Combined with rum, lime, and mint it makes for a cocktail that is both delicate and delightful. Double strain into a glass filled with crushed ice. Garnish with a cherry tomato and mint. A sample of Maker's 46 was received for this post. This father's Day is particularly special for my family, as it will be with my husband's first. Finding out we were having a baby was the biggest surprise of our lives. Now, that our daughter is here we couldn't imagine life without her. To mark the special occasion I decided to create a Build Your Own Old-Fashioned Bar for Father's Day. Simple to create, a Build Your Own Old-Fashioned Bar is a great way to impress guests while keeping you free to mingle. Simply provide a bottle or two of bourbon, citrus (lemon, orange, grapefruit), sugar, and spices. Guests will have fun creating their own Old Fashioned recipe. It's tradition in my husband's family to celebrate Dad with a bottle of bourbon. Every year my husband searches for a new bourbon he and his dad (and I) can share. This year we'll be sipping Maker's 46. Maker's 46 is the newest product from Maker's Mark. Fully matured Maker's Mark is aged with seared wooden stages until the flavor is exactly right. At 94 proof Maker's 46 has a rich and creamy caramel flavor with an oaky flavor. The perfect bourbon for enjoying an Old Fashioned. Muddle bitters and sugar in an Old-Fashioned glass. Fill glass 3/4 full of ice. Add Maker’s Mark® Bourbon and splash of club soda or water. Combine 2 parts steeped ginger tea with one part granulated sugar in a mason jar. Seal jar tightly and shake until sugar dissolves. Combine bourbon, syrup, and bitters in an old-fashioned glass. The following post is sponsored by Spytail Rum. This spring I had the pleasure of working with a rum like no other. Based on a 19th-century recipe, Spytail Rum is made with fresh ginger root and spices in Cognac, France. Ginger is one of my favorite flavors to work with, I was excited to give Spytail a try. I became even more excited when I saw the rum's nautical themed packaging and unique round bottle. I was not disappointed. The robust ginger flavor plays well in a number of cocktails, while also enjoyable on its own or on the rocks. Spytail's spice elevates a rum & coke and was simply refreshing combined with ginger beer. But my favorite Spytail cocktail would have to be the Spytail Daquiri. A delicious combination of Spytail rum, grapefruit, lime, and honey. Combine lime juice and Spytail™ Rum. Add ice. Top with ginger beer. Shake. Strain. Serve up or on the rocks with lime garnish. In a saucepan, bring milk to a simmer. Stir in condensed milk. Reduce heat. Using a whisk, slowly stir in chocolate chips. Once chips have melted, add in cocoa powder. Continue stirring until smooth. Now add vanilla and salt. Continue to stir a minute longer then remove from heat. Add hot chocolate to heat resistant mug. Top with marshmallow fluff. Roast using a kitchen torch. Visit thekitchn.com for Homemade Marshmallow Fluff recipe. If you asked me what my biggest struggle is when it comes to mixing cocktails, I'd have to stay storing the recipes. I currently have about 4-5 different places where I keep my favorite cocktail recipes. They range from homemade journals to cell phone notes and computer files. None of these methods are anywhere near perfect and have left me longing for a better system. Then a few weeks ago a Facebook friend shared a pic a cocktail journal that appeared to be everything I had been dreaming of! The Spirit, Mixer, Garnish, & Glass cocktail recipe journal is a must-have for every cocktail enthusiast and bartender out there. A stylish journal that allows you to store your recipes by spirit, with space to note your garnish, glassware, and more! I recently got the chance to pick the brain of co-founder Ben Putano and here's what he had to say about this handy dandy notebook. How did the Spirit, Mixer, Garnish, & Glass journal come about? BEN: One night I was having friends over to make cocktails. I was picturing the hassle it would be to talk through all the ingredients we had and all the possible drink options, so I found a small journal lying around and wrote 5 or 6 cocktails recipes that I knew we could make. My friends were then able to flip through the book, find a drink they wanted to try, and (best part) make it themselves! It was so easy and a lot of fun. It was like having my own house cocktail menu. A few days later, I had another friend over for a drink and we were talking about the journal. Then we started brainstorming what a dedicated cocktail recipe journal would look like. This guy, Brett Vance, ended up being my partner for the project. Brett is a photographer, graphic designer, and fellow enthusiast of coffee and cocktails. We mocked up a design for the journal and I posted it on the Coffee Cocktails instagram feed. Then I reached out to people individually and asked them about their experiences making cocktails. I asked how they record their recipes, what information they record about each drink (glassware, garnish, etc), and if they would be interested in a dedicated cocktail recipe journal. The feedback was positive enough for Brett and I to improve on the original mock up and launch a design competition for the front cover on 99Designs. We received 65 entries for the front cover design competition, and then had the growing group of contributors actually choose the winning design. This group also voted on other design aspects like journal size, color, and features (elastic band, bookmark, etc.). In the end, around 400 cocktail enthusiasts participated in the design. What is your cocktail background? BEN: I actually work in the coffee industry, formerly a barista and now doing customer education for a coffee equipment company. I'm a big cocktail fan and started an Instagram account called Coffee Cocktails which has provided a lot of informal cocktail education for me. I notice you also have a blog by the same name. BEN: I became fascinated by coffee cocktails after writing an article about them in Daily Coffee News. For a year I sat on the idea of starting a coffee cocktails-related resource, honestly assuming someone else would start something before I got to it. When no one did, I registered CoffeeCocktails on Instagram, grabbed the domain (coffeecocktails.co) and starting featuring great cocktails from around the world. It’s introduced me to a lot of amazing people in both the coffee and cocktail worlds, which are surprisingly similar. It’s all about passion for crafting a really high-quality product. I love that! Favorite cocktail (either classic or original)? The fellas at Spirit, Mixer, Garnish, & Glass have launched a Kickstarter campaign in hopes of raising up to $15,000 for the production of their cocktail journal. Supporters will be the first to receive Spirit, Mixer, Garnish, & Glass in various quantities. Fundraising ends November 15th with deliveries beginning December 11th. Personally, I can't think of a better Christmas present for my favorite cocktailians! Now my only dilemma is 'how many to order? '.